Lake Barrington Naples Lakes Country Club Condos: THIS IS THE ONE YOU'VE BEEN WAITING FOR. TOP FLOOR END UNIT-lots of windows, lots of light. Wadsworth model with 3 bedrooms, 2 baths, 2-car garage. Private membership in the recently renovated Arnold Palmer Signature Golf Course included. This impeccable home is loaded with upgrades and extras. Freshly painted in neutral tones. Gorgeous kitchen with granite, tiled backsplash, stainless appliances, upgraded sink and faucet. Master bath features separate shower and garden tub, dual vanities, new comfort height toilets, new sinks, faucets and granite counters. All three bedrooms have new wood flooring. Crown molding, plantation shutters, new fans throughout. New A/C in 2012 and new hot water heater in 2016. Beautifully and tastefully furnished-TURNKEY! Spacious wrap-around lanai overlooks hole #17. Quiet location at the back of the complex and at the end of a cul-de-sac. Close walk to community pool/spa. Private two-car garage in building. Naples Lakes is a gated, bundled golf community featuring newly renovated clubhouse, fitness center, excellent tennis program, resort pool/spa and cabana grill. No clubhouse minimum. Plus you can own your own golf cart. Naples Lakes Country Club Condos: A PRIVATE ELEVATOR PLUS A GREAT GOLF COURSE VIEW WITH THIS RARELY AVAILABLE TOP FLOOR END UNIT. Located in quiet area of the complex with a great view of the Arnold Palmer Signature Golf Course and a short walk to the community pool and spa. Very spacious floor plan offering 11 ft. ceilings, 3 bedrooms, plus den and 3 full baths. Open kitchen with breakfast bar, tiled backsplash, pantry, and center island. Master bedroom measures 18' x 16' with 12' x 8' walk-in closet. Generous master bath with garden tub, separate shower and dual vanities. Speakers in master bedroom, living room, kitchen and lanai. Huge wrap-around lanai overlooks #13 hole (par 3) on the golf course. Two-car attached garage. New a/c unit. Naples Lakes is a gated, bundled golf community with private membership in an Arnold Palmer Signature Golf Course. Newly renovated clubhouse, cabana grill, resort pool/spa, state-of-the-art fitness center, excellent tennis program, aqua driving range and putting greens. No clubhouse minimum and you can own your own golf cart. Conveniently located near beaches, shopping, 5th. Ave., restaurants and I-75. Lake Arrowhead Naples Lakes Country Club Condos: FANTASTIC GREEN SIDE VIEW OF ARNOLD PALMER SIGNATURE GOLF COURSE from this gorgeous first floor end-unit featuring a spacious open floor plan of 1,908 sq. ft. with 9 ft. ceilings, beautifully "Designer" furnished Turnkey, & loaded with upgrades. New A/C in 2015, new hot water heater 2019, new carpeting 2016, updated guest bath 2016, upgraded lighting, fans & blinds. Open kitchen features breakfast bar, pantry, updated appliances & adjacent 10 x 10 breakfast nook. Great room measures 20' x 16' with 14' x 11' dining area. Generous master bedroom is 19' x 13' with 2 closets (one walk-in). Master bath has dual vanities, walk-in shower & garden tub. Located on quiet cul-de-sac street with easy access to community pool/spa. SELLERS HAVE PAID THE GOLF COURSE AND CLUBHOUSE RENOVATION ASSESSMENTS IN FULL. No clubhouse minimum and you can own your own golf cart. Naples Lakes is a bundled golf community with private membership in Arnold Palmer Signature Golf Course, excellent tennis program, newly renovated clubhouse featuring casual and fine dining, fitness center, cabana grill resort pool/spa & aqua driving range. Conveniently located to shopping, restaurants, beaches & 5th. Ave.
Quail Creek Village Condos: Looking for the “WOW” factor? Your search is over. From the minute you enter this impeccable 3 BR / 2 BA 2nd fl. condo with fantastic golf course views, you will be impressed. This meticulously cared for home has a very desirable split bedroom floor plan allowing for the utmost in privacy. Nicely appointed with wood laminate and tile flooring, crown molding, plantation shutters, top of the line LG appliances and more. A newly updated kitchen is the prized jewel in the crown, boasting gorgeous quartz countertops, LG stainless steel appliances, designer choice “farmers” sink, self closing cabinetry, custom light fixtures and much more. Serious inquires only! Naples Sandpiper Bay Club Condos: SUNRISES with beakfast! SUNSETS & preserve privacy with happy hour on your lanai! This renovated 3rd floor, END unit with Oak beamed cathedral ceiling really is one of the Association's nicest! ALL NEW kitchen with Oak cabinets, OAK pantry, MOEN plumbing & a new huge quartz countertop/bar area! ALL NEW baths with GRANITE showers (MY Shower Doors), Oak vanities with GRANITE TOPS, new MOEN plumbing, and new Master Bath shower exhaust fan which removes humidity to outdoors (most NSBC Association bath ceiling fans merely recirculate air; they do NOT exhaust it from the interior of bathroom out of the condo). Docks are assigned and transferable. PRICE JUST REDUCED $5,000 BELOW CERTIFIED APPRAISAL!! Quincy Square Madison Park Condos: Resort living, low fees, TURNKEY FURNISHED, excellent location, gorgeous lake view! This gorgeous coach home has only had one owner, and very little use- still feels new. This is one of the newest buildings in the complex, built in 2009, and one of only two buildings in the complex that has the upgraded hurricane code construction reinforcement such as double pane glass windows and green technology. Enjoy watching birds, turtles, eagles and owls from your LARGE SCREENED LANAI over your GORGEOUS LAKE VIEW! This 3 bedroom, 2 bath, 2 car garage 2nd floor residence is an END UNIT, and has about $50,000 in upgrades- including diagonal tile, crown moulding in tray ceilings, baseboards, plantation shutters throughout, elegant granite, etc... The unit features neutral paint and decor, and is professionally furnished- ready for you to move in! See the attached 3D tour of unit! Also, new AC unit installed August 2018, new Dryer February 2019. Madison Park has a fabulous, central location- minutes from beaches, dining, shopping, and easy access the the interstate and airport. Quincy Square residents also have access to group membership at Walker's Marina for $25 per year! Forest Lakes Homes: A Forest Lakes Gem! Roof Nov 2016 and back lanai has electric roll down shutters on an oversized screened in lanai. Situated on a pond that is backed up to extreme privacy. Very quiet location. House is in good condition new buyer will need to update to their liking. Exceptional value this close to the beach, shopping and all Naples has to offer. Located in a golf course community with no HOA's! Imperial Golf Estates Homes: Well cared for move-in ready pool home ready for your furnishings. Wonderful curb appeal showing off the new lush landscaping and paver drive. New roof, shutters, impact windows, AC, appliances and tile floor all in late 2017 and early 2018. Located in one of North Naples finest gated communities - Imperial Golf Estates. Upon entering you are greeted with high ceilings and a open floor plan inviting you straight to a large screened-in outdoor lanai with a spacious pool & oversized covered area for entertaining. 3 bedrooms and 2 full baths offering family or guests plenty of space. Large closets for all your possessions. Kitchen is nicely equipped with new stainless steel appliances, nice cabinets and a view directly overseeing the pool area. Oversized 2-car garage allowing for easy access and lots of storage. Imperial has a convenient back gate accessing Livingston Road that ONLY estate owners may use. The front gate puts you minutes to Vanderbilt Beach, Barefoot Beach, Delnor-Wiggins Pass State Park, dozens of fabulous restaurants and the hottest spot in Naples - Mercato. Membership to Imperial Golf Club's (2) 18-hole championship golf courses is optional. Naples Park Homes: GREAT INCOME PRODUCING OPPORTUNITY in Naples Park. Corner lot 6th & 104th. Property has been rented for $2100 per month for last 2 years. BEFORE upgrades. New carpet, paint inside and out, all new appliances. 5 bedrooms, separate dining area, previous garage area is air-conditioned. Comps show similar property rented at $2400 per month. Bike to Beach! Short distance to everything you could need. Restaurants, shopping, movies! NO HOA rules. GREAT LOCATION! Golden Gate Estates Homes: This is a Perfect starter home or investment property. When you first walk into this house you will feel right at home. You are welcomed with an open floor plan. Big Breakfast bar. Laundry inside the residence. Plenty of storage space. The bedrooms are a great size with ample closet space. The master bedroom is roomy, master bathroom has the closet located within. You must see this home in person. Motivated Sellers. Verona Walk Homes: Impeccable 4 bedroom 3 bath house in the luxurious and captivating community of Verona Walk Naples. Landscaped yards that you never have to deal with keep the area feeling tropical and inviting. Extra Florida sunshine pours into this home because of the glass entrance and pool doors that were upgraded. This spotless pool home has been updated with crown molding and tile throughout the entire downstairs living space and bedroom. Make your way up the steps and enjoy wood floors throughout the upstairs bedrooms. In the mornings sit out on your second floor balcony looking out over the water and listening to the birds while sipping your warm cup of coffee. This home was built by the famous and trusted Divosta builder. The poured concrete walls help with sound, stability, security and energy efficiency. Enjoy the resort style community center without any extra or mandatory fees HOA fees. All included: Basketball, Har-Tru Tennis Courts, Bocce, Pickle Ball, Playground, Lakes to Fish and Kayak in, Lap Pool, Resort Pool, Restaurant, Salon, Gas Station, Car Wash, Community Center, Full times Activity Director and more. Avalon Condos: FIRST FLOOR CORNER UNIT WITH LAKE VIEWS! Why wait for construction? Save thousands with this heavily upgraded and move-in-ready condo! Enhanced with incredible features such as a beautiful lake view overlooking the clubhouse, wood plank flooring, upgraded quartz counter-tops, upgraded cabinets, enhanced lighting, crown molding and plantation shutters... Over $30,000 in upgrades! 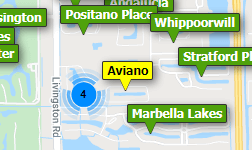 The popular community of Avalon encompasses 23 acres ideally located close to Downtown Naples, white sandy beaches, and numerous dining, shopping, and entertainment options. This is the best value available within Avalon of Naples and offered with the furnishings negotiable. Schedule your private tour today! Woodshire Forest Lakes Homes: This 3 Bed, 3 Bath attached 2 story villa has been nicely updated, with golf course view. Located in the heart of Naples! Lovely attached villa in the Woodshire neighborhood of Forest Lakes allows a large dog (or a cat) and has low fees. Located only minutes to shopping, the beach, the movies, I-75, and more. Other features include bright eat-in kitchen, attached one car garage, skylight in living room, first floor bedroom, and newly tiled showers. Schedule your private showing today! Deauville Lake Club Condos: This is an awesome 2 bedroom 2 bathroom ground floor opportunity for the new owners. Gorgeous lakefront view. Watch the sunrise over one of the two community clubhouses, both with heated pools, and the main clubhouse even features a community spa tub, cabanas, community gas grills, covered shuffleboard players area, har tru tennis courts (lighted), all nestled on a giant circular drive with tropical, lush landscaping and some of nature's most entertaining (remember, they are wild) creatures such as fish, turtles, snow owls, foxes, bunnies, and so much more. Opportunity only knocks once, so why not take a chance and throw caution to the breeze. Rental policies are 30 day minimum, 6 month maximum, and no concurrent leases. Approval process for association is 20 days. Eagle Creek Estates Eagle Creek Homes: H.12235 - Luxuriously large family home captivates a warm welcoming vacation feel as soon as you walk through the front door. Bright open floor plan with soaring ceilings that open to the main living and dining room, silhouetted against a series of picture windows offering natural light and brightness. Gently sitting on a quiet, beautifully landscaped cul-de-sac and turnkey for your comfort and enjoyment. Spacious and spotless kitchen opens up to casual family room and dinette for easy breakfast gatherings. The breakfast bar leads to the resort-style outdoors entertaining and summer kitchen, with outdoor tv. Luxurious swimming pool and handy outdoor bathroom for the children. (new lanai cage installed 2018). Walking distance to the Club house and fitness center, swimming pool, casual dining, tennis courts & driving range. This home is located in Eagle Creek Golf & Country Club, perfectly located between Naples and Marco Island with a championship 18 hole golf course & 7 har tru tennis courts. This small community & limited Memberships translates to daily play if you wish. Beaches, downtown dining, access to the airport, all within easy reach. Social or Golf Membership available. Cypress Glen Village Condos: Pristine move-in ready CORNER UNIT townhome in prime Naples location! This 2 bedroom 2.5 bath residence is one of the FEW townhomes in Naples under $165K located just 4 miles from the beautiful Naples beaches, quick access to I-75 and less than a mile from shopping and dining. This coveted corner unit provides additional windows in the great room and bedrooms making it brighter and more open than the interior units. Laminate wood flooring in the great room, tile in kitchen and carpet in the bedrooms. The second floor boasts TWO MASTER SUITES each with their own bath, one with dual sinks. Kitchen is equipped with stainless steel appliances, recessed lighting and cabinet lighting. Enjoy a beautifully landscaped view from your dining room table and open patio. Grills are allowed! The unit comes with 2 covered carport spaces located right outside your front door. Cypress Glen features 2 community pools and a clubhouse to enjoy. Black Bear Ridge Homes: This elegant beauty is located in Black Bear Ridge, a tucked away cozy little community, in beautiful Naples Florida with quick quick access to Collier Blvd & Vanderbilt Beach Rd from the main gate! This lovely & large home boast 3 Bed+Den, 2 1/2 baths and a 3 car garage! Stepping through the massive front door, you will enjoy a large open floor plan that is bright and airy. Beautiful french doors lead you to the Study/Den, which easily doubles as an extra guest room, home office or gym. A tastefully upgraded beautiful and bright kitchen awaits with stone countertops and backsplash, stainless steel appliances, breakfast bar, eat-in-nook and a large pantry. Top quality PGT contemporary sliding french patio doors that lead out to your tranquil lanai. Also offering a very RARE fully FENCED yard which is grandfathered in providing instant privacy enjoyed by few in this 100 home community! The master suite has a warm elegant feel, the large bathroom presents dual vanities, with separate tub and shower, his/her closets as well as a private door off the master that immediately leads out to the lanai. Equipped with hurricane impact windows & doors throughout! Enjoy Your Private Tour Today! Heritage Bay Homes: STUNNING long lake views from this meticulously maintained home. This Southern exposure home is 3 bedrooms plus a den, which can also serve as a fourth bedroom as it has its own walk-in closet. The kitchen has beautiful hardwood cabinets, stainless steel appliances, and gorgeous granite counter tops. The master bedroom has custom hardwood floors and is situated in the rear of the home with access to the pool and spa. Large neutral tile in the living area and custom plantation shutters throughout the entire home. All windows and doors are impact rated and a new roof will be installed shortly. The amenities in Heritage Bay are endless... 27 holes of bundled golf, a very active tennis and pickleball center, stunning community clubhouse with its own restaurant. The clubhouse pool area is a residents favorite. There are also numerous clubs and groups that many of the residents participate in. Professional photos coming soon! This home will not last long!! Verandas At Quail Run Forest Lakes Condos: Neat and clean 2 bedroom 2 bath condo that is located in the center of town. Beautiful pond and golf course views from the living room and lanai. Golf is optional by the way! The buildings have all been recently painted, new roofs installed too. This unit comes furnished, with ceramic tile flooring throughout. The guest bedroom is carpeted. A full-size washer and dryer are in the kitchen. White kitchen cabinets with Stainless Steel appliances, brand new refrigerator. This community is located just minutes from the beaches, shopping, grocery and restaurants. It's an affordable Florida get-a-way or investment property. Take a look at the pictures, notice the great views from the lanai! Isles Of Collier Preserve Condos: Welcome to Isles of Collier! Built in 2016, this Orchid Grande model offers an open floor plan complemented with over 90k in upgrades. Beautiful wood-look tile flooring, upgraded tile kitchen backsplash, tray ceilings, generous walk-in pantry and crown molding throughout. Expansive master suite, all impact windows and doors and a spacious 2 car garage with an abundance of storage space. Enjoy beautiful sunsets over the Cypress Waterways from the top wrap around deck offering stunning views of gorgeous landscaping and wildlife. Perfectly positioned southern exposure gives this unit a bright and airy feel. Take the stairs or ride the elevator up into this incredible property. Isles of Collier Preserve is a highly sought after pristine gated community located just minutes from downtown Naples and some of the most desirable shopping, dining and world-class sugar sand beaches. Spectacular resort-style pool, state of the art fitness center, tennis/pickle ball facilities, kayak/paddle-board launch sites, 8-miles of hiking trails and much more. The highly acclaimed Overlook Bar and Grill is officially open providing casual on site dining. Make 6545 Dominica Dr your new Naples address. Aversana Hammock Bay Golf And Country Club Condos: WOW! GORGEOUS FORMER MODEL PROFESSIONALLY DECORATED IN A CASUAL ISLAND THEME AND OFFERED FULLY TURNKEY FURNISHED. EVERY DETAIL HAS BEEN DONE IN THIS BEAUTIFUL RESIDENCE BOOSTING NUMEROUS UPGRADES AND DESIGNER FINISHES. A TRULY UNIQUE RESIDENCE BOOSTING ONE OF A KIND CUSTOM ACCENTS. ALL NEW AVERSANA POOL AREA ENCOMPASSES RESORT ELEGANCE AT ITS FINEST. NEW PAVERS AND LANDSCAPING IN THE FRONT OF THE BUILDING ENTRANCE SETS THE TONE FOR DECADENCE, AND FINISHES IN THIS EXCEPTIONAL DWELLING. THIS FORMER MODEL RESIDENCE IS THE UNIT TO BE SEEN AND WILL IMPRESS. Need professional assistance selling your property at Naples? Find out how an Area Specialist can help to generate more property exposure in order to get the most money for your investment in the least amount of time.